As runners, we’ve all made a commitment to good health. But to be as healthy as we can be (not to mention perform our best as athletes), we need to eat the right stuff, even for Thanksgiving. Real runners need real food. As we’re gearing up for the Holidays we should remember that our love for food should not supersede our love for running. Ever go out for a run after a big meal? Not the best feeling, huh. Thanksgiving is a great time to spend with family and friends, but it shouldn’t drain your running routine. 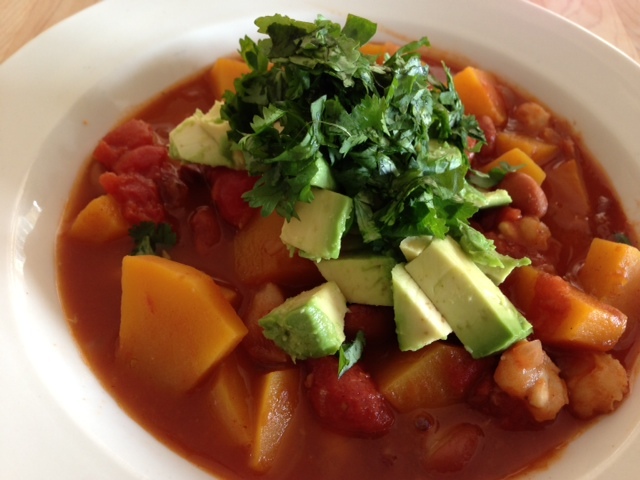 The recipe for this week, Butternut Squash Tomato Posole, comes from Eating Well, a great site for truly delicious meals that are healthy and tasty. This hearty stew will not only fill you up, but help boost your energy. Packed with 9 grams of protein, 335 calories per serving, and 100% guilt free yumminess. Butternut Squash Tomato Posole. Right before I ate it for lunch! Fresh avocado and cilantro give this stew just an added kick. Everyone enjoyed it for lunch and I am sure you will too. Read my tips below before diving into the recipe. Just a few suggestions I’d like to give you before you dive into the recipe from Eating Well. I drained the beans and hominy before putting them in the stew. I used half as much (1 tbs) of the Chili powder. I have two kids and a husband that don’t like spiciness, I have to sacrifice, so I add any needed spice for myself when I eat. Although I found that the 1 tbsp was sufficient for me too. A tip from Eating Well was to buy the butternut squash peeled and cubed. Didn’t have this option, so I bought a whole one and had it peeled and cut the night before I made the stew. With the squash ready to go it took me a total of 45 minutes from start to finish. This is a great dish, one that’s perfect for these cold Autumn nights. Take comfort knowing you are filling up on food that won’t slow your training down. We are always on the lookout for healthy food options to bring to our dinner table. Hope this recipe becomes one on yours. Try it out before Thanksgiving and let us know what you think by commenting. Is this a good stew to serve to Holiday guests?